As the regular season entered its final weeks, and even its final day, not too many people expected to see the New York Rangers and the Ottawa Senators meet in the first round. But after the Rangers lost to the Washington Capitals and the Senators lost to the New Jersey Devils on Saturday afternoon, the Senators dropped below the Capitals to the 8th spot in the Eastern Conference and drew a 1st round matchup with the Atlantic Division Champion Rangers. Although the Rangers finished 17 points ahead of the Senators, Ottawa won 3 of the 4 meetings between the two clubs during the regular season. Another reason why this matchup is interesting is because of the contrast between the Rangers and Senators. The Rangers finished 3rd in the league in goals against per game, while the Senators were in the bottom third of the league in that category. On the other hand, even though the Rangers were in the top half of the league in goals per game with 2.71, the Senators averaged 2.96 goals per game, good enough for 4th in the NHL. Forwards: Although the Rangers and Senators differ in many respects, they both rely on a few players to provide the majority of their offense. 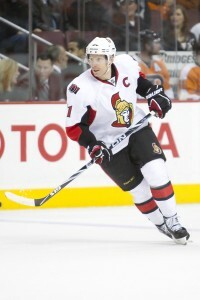 In Ottawa, the top line of Jason Spezza, Milan Michalek, and captain Daniel Alfredsson combined for 39% of the team’s scoring. Outside of their top line, the highest scoring forward for the Senators was Nick Foligno with 47 points. On the Rangers side, the majority of their offense came from Marian Gaborik, Brad Richards, and Ryan Callahan. Gaborik rebounded from an off-year in 2010-11 by scoring 41 goals and registering 76 points, the 2nd time in 3 years in New York that he eclipsed 40 goals and 70 points. Richards, in the first year of a nine year contract with the Rangers, had trouble co-existing with Gaborik until late in the year, but despite a mid-season slump, finished with 25 goals and 66 points. Callahan finished 2nd on the Rangers with 29 goals, but the Rangers secondary scoring struggled, as players like Brandon Dubinsky and Brian Boyle struggled to score throughout most of the year. Defensemen: Both the Rangers and Senators have all-star defensemen in their lineup. The biggest story on the blue line in the NHL this year has been the Senators’ Erik Karlsson, who finished 2nd on the team and led all NHL defenseman with 78 points. In addition to Karlsson, the Senators have veteran Sergei Gonchar, stay-at-home defenseman Filip Kuba (who was tied for 9th in the NHL with a +26 plus/minus rating) and ex-Ranger Matt Gilroy. On the Rangers’ side, their defensive standouts have done a tremendous job in shutting down other teams’ top lines. Dan Girardi was a first time all-star this year, averaging over 26 minutes a game while playing with Ryan McDonagh, who finished with a +25 plus/minus rating in his first full season in the NHL. In addition to the top pair, Marc Staal took a while to return to form after missing the first 36 games with concussion like symptoms, but has played his best hockey of the year in recent weeks. Michael Del Zotto, who spent half of last season in the AHL. rebounded this year by leading all Rangers’ defensemen with 10 goals and 41 points. 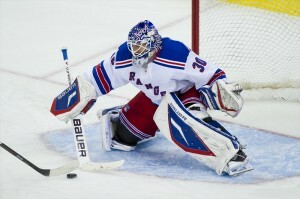 Goaltending: In between the pipes is where there is a definite difference between the two teams. The Rangers’ Henrik Lundqvist has had a career season this year, setting career bests in wins (39), goals against average (1.97), and save percentage (.930), and is the frontrunner to win the Vezina Trophy. For the Senators, Craig Anderson has done a solid job in his first full season in Ottawa, finishing with 33 wins and a .914 save percentage. Final Analysis: The Senators have given the Rangers problems during the regular season by clogging up the neutral zone and maintaining puck possession. The Rangers need to find a way to get the puck below the circles in Ottawa’s defensive end and set up opportunities from there. Defensively, Karlsson and Gonchar will help the Senators offensively but how they will hold up in their own end is questionable. On both sides, if they can shut down each other’s top line, it will be a low-scoring series because both teams don’t have a lot of depth offensively. However, the difference will be in net. Although Anderson has performed well in past playoff appearances, Lundqvist is head and shoulders above him. Prediction: Although they are the 8th seed, the Senators will make the series interesting. However, the better team will advance in this series. Rangers in 6.